← Moth news for February and March from IGC. Pests in the house again! Been picking up Tinea pellionella in the house again. What are the little buggers destroying this time around? 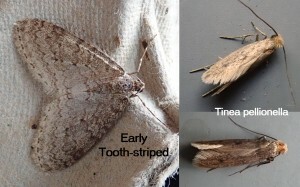 Also after a recent cold spell I caught the first Early Tooth-striped at my home. Seen a number in local woodlands but the first one to wander to the traps at home. This entry was posted in Sightings. Bookmark the permalink. 6 Responses to Pests in the house again! Hopefully NOT another Moroccan rug! Interesting about the Early Tooth-striped – I have also taken a specimen at Bawdsey this season. Even more interesting as Paul Kitchener has taken one at Shottisham. None here at IGC yet this year and it’s normally annual! My first record for this year was 26th March which was earlier than average. It is fairly common this end of the county although never in great numbers. My best record was 16 on 19th April 2018. I presume you are talking about the Tooth-striped Brian, hopefully not the Tinea! Correct Raymond. I’d be very concerned if it were 16 Tinea. Only ever seen it once in the house.